Bradford City Football Club has invited the publication of this article in order to open a debate as to how to commemorate the Bradford Pals at Valley Parade. At the end of the piece are details of where your views are requested. Across the world commemorations have begun to mark the centenary of the Great War. The next four years will witness numerous acts of remembrance. As Bradford City AFC lost nine players in the Great War it is important that we, as a club and a community, consider an appropriate manner to honour, not just the nine players, but also the thousands of Bradfordians, who died in that terrible conflict. The Great War broke out on 4 August 1914 just as the 1914/15 football season was about to get underway. 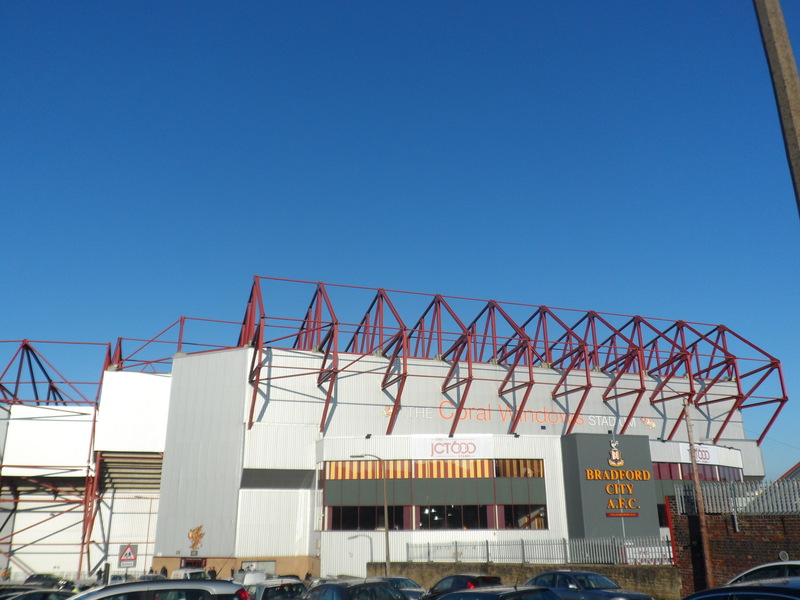 As one of the top five sides in the country, Bradford City approached the new season with an expectation of success in both the league and cup competitions. Bradford (Park Avenue) had joined their neighbours in the top flight giving the city of Bradford two first division teams. At first it was not expected that the outbreak of war would have too much impact on the football season. This was a reflection of the popular sentiment that ‘it would be all over by Christmas’. Both Bradford clubs admitted soldiers free of charge to their matches and made substantial donations from gate money to the War Relief Fund. As the war ground to a stalemate it was realised that a large army would be required to achieve victory. To boost recruiting local battalions were formed so that men could serve alongside their friends, these became known as the ‘Pals battalions’. The appeal to local patriotism was obvious and the Pals battalions adopted the name of their respective towns. Those recruited in September 1914 became known as the Bradford Pals. Each new recruit was given a metal badge displaying the city of Bradford coat of arms as its centre-piece. The Bradford Pals were based at the Valley Parade Barracks which was just behind City’s Main Stand. In October 1914 almost the entire Pals battalion of 1,069 men were among a 25,000 crowd that saw City thrash Aston Villa 3-0. Fittingly Oscar Fox, who was to later serve with the Pals, scored a second half hat-trick. Although the continuation of the Football League fixtures attracted some criticism, there was little doubt that the game aided fund raising and recruiting. At several matches the Bradford Church Lads’ Brigade collected money for the Lord Mayor’s War Fund and cigarettes for the soldiers. Even the highly anticipated first ever Football League meeting between Bradford City and Bradford (Park Avenue) was overshadowed by the war. While the majority of the 29,802 crowd would have enjoyed the City’s thrilling 3-2 victory, there was no escaping the conflict. At half-time the former president of Bradford City, Alfred Ayrton, made a short, but rousing, speech, which was followed by showers of money and cigarettes onto the pitch. By December 1914 it was reported that ten thousand Bradford men were in military service. Arguably, the last echo of Bradford City’s golden pre-war era came on Boxing Day 1914 when 35,000 spectators crammed into Valley Parade for the visit of Everton. Many were in uniform and apparently there was a strange atmosphere in the ground. Perhaps it was recognised as the last great gathering before many would leave for the front and the possibility that some would never see Bradford again. As 1915 dawned the fact that of 1,800 professional footballers only 122 had enlisted in the armed forces was used to criticise the game. It was a little unfair as most footballers had signed one year contracts before the war had broken out. Given the ‘it’ll be all over by Christmas’ sentiment it is understandable that there was not a flood of footballers to the recruiting offices in 1914. However, during 1915 that situation would change dramatically. Of course, some were already at the front. Frank Buckley, who had cost City a considerable transfer fee in the summer of 1914, had been released from his contract and was serving with the Footballers’ Battalion. Bradford City’s former centre half Gerald Kirk and the Bradford (Park Avenue) amateurs Donald Bell and Kirby had also enlisted. Two City players, Dickie Bond and Harry Walden, both of whom had previously served in the army, joined the Bradford Pals in April 1915. In time, several City players would also join the ranks of the Bradford Pals: the Scottish international goal keeper Jock Ewart, Cleckheaton born Irvine Boocock, Joe Linford, and, as previously mentioned, Oscar Fox. The final game of the 1914/15 season was the derby match at Bradford Park Avenue on Wednesday 28 April 1915. The Bradford Daily Argus carried full length portraits of Bond and Walden in their army uniforms. On the same page, the sad news of the death of former City player Gerald Kirk was announced. He died of wounds sustained whilst leading his company into action in Belgium. The kick off was moved back to 6pm to allow thousands of workers in overalls to attend the match straight from their factories. At half-time the 25,000 crowd watched Captain Burton of the Bradford Pals hold up the front page of the Bradford Daily Argus that featured the photographs of Bond and Walden. Dickie Bond donned his corporal’s jacket to join his captain in appealing for new recruits. Avenue’s 3-0 victory should have been a moment to savour for the Avenueites, but instead it was the last Football League match for both clubs for four long years. On the morning of 1 July 1916 the 2,000 men of the Bradford Pals left their trenches to make an attack the German lines during the Battle of the Somme. In little more than an hour 1,770 had been killed or wounded. It was one of the darkest days in the history of the city of Bradford. Throughout the period 2014 to 2018 Bradford City AFC will be commemorating the loss of the nine players who died via a series of articles in the matchday programme. Clearly, given the close ties with the Bradford Pals, and the recruiting drive during 1914 and 1915, that period in our history should be remembered. One suggestion is that the club should adopt the badge of the Bradford Pals for the 2015/16 season. It would be a visual reminder of those who went before us and endured so much. The original badge appears below, and Bradford City Football Club would like to know your feedback on whether you would like to see it adopted on such matters as next season’s Bradford City shirt. The badge is a great idea but could we go one step further and wear a replica kit from that era for the season? I’m not sure enough people would go for the shirt Vaughn. It’s not a style that would make people want to buy it I don’t think. The ‘Pals’ badge is an excellent idea but on its own it is difficult for all the crowd to see. Perhaps we could ask our kit suppliers to produce a complete replica kit from that final season and include the ‘Pals’ badge? For one season we could also remove the black wreath on the shirt back collar. We could replace this with a black number 9 to remember the number of Bradford City players lost in that terrible conflict. We did, of course, have the 1911 shirt 3 years ago. How much different the 1914-15 was I have yet to research. The club could possibly get permission to carry the lost player’s name on the back of the appropriate shirt number worn by the lost players . This could be in black under the present day player’s name. I would have no problem adopting that badge for next season, It’s a small way of showing our appreciation to those men. I think adopting the badge and going for the replica shirt as suggested by Vaughan is a good idea. Really interesting article David, I really enjoyed reading it. I’d love for the badge to be used for a season. It would be a fantastic way of commemorating those lost. Great idea badge looks good and the replica from that year sounds like a good idea to me too I’d buy it. A simple and dignified tribute, let’s go for it. I think adopting the Pals Battalion badge for a season would be a fitting tribute. An alternative would be to have the badge displayed on the sleeve or somewhere on the front of all shirts including replica ones for that season. The badge is a great idea!! A replica shirt from that time is also a great idea!! Let us not forget!! Many thanks for the responses, which I’ll ensure are passed on to Dave Baldwin. As regards a replica shirt, we are suggesting that one is produced for the 2017/18 season as that season covers the 100th anniversaries of the deaths of the famous FA Cup winners Jimmy Speirs and Robert Torrance. Hence the 2015/16 season will be the badge only. The badge is a brilliant idea. 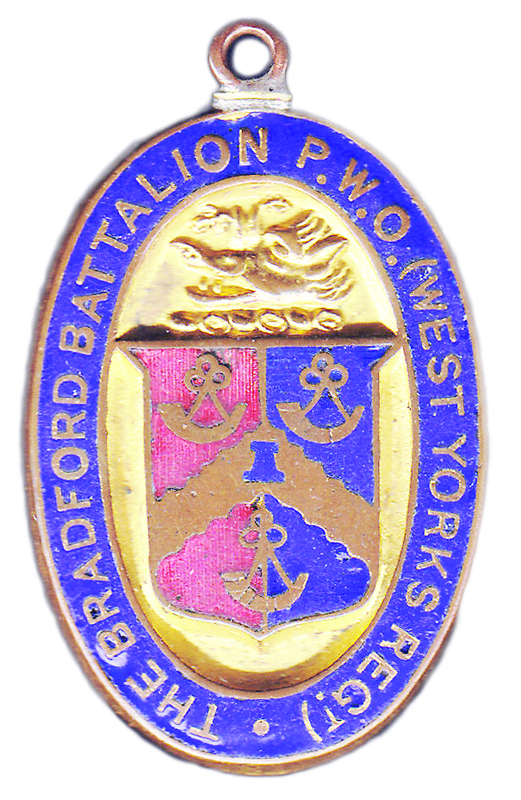 For those that don’t know, the P.W.O on the Bradford Pals badge above stands for Prince of Wales Own, there were three Bradford Pals battalions, the 16th, 18th and 20th (service). Other Battalions raised in the city were the 6th territorials (1st 6th, 2nd 6th, 3rd 6th(service) Prince of Wales Own (West Yorkshire Regiment) based at Belle View Barracks and the 10th Battalion Prince of Wales Own (West Yorkshire Regiment), possibly regulars. The 10th Battalion Prince of.Wales Own West Yorkshire Regiment had 733 casualties at Fricourt, the worst loss of any of the battalions on the whole battle front engaged on the first day of the Battle of the Somme. My grandad was at the 1911 cup final and one of the wounded from the battle of the Somme. Fully support this. Be excellent tribute on the shirt and maybe scarves/hats for supporters to obtain. Love the idea of the replica kit for 2017/18 too. Another excellent article David. The sharing of such ideas and willingness of the club to get involved underlines the special bond between our club and supporters once again. Makes me cry. I think the badge and replica shirt are great ideas. Just recently, last week in July , my son and I spent a week in Belgium and Northern France . We paid our respects to Jimmy Speirs at his grave near Passchendaele we also went to the village of Serre .This was the oblective of the Bradford Pals on the first day of the Somme and sadly where most of the Pals are burried . We traced the route from where they were billetted the night before , Bussy Les Arcs , to the trenches where they formed up and we walked over the same fields where they were cut down by machine guns and artillery fire . My great-grandad was too young but lost three brothers in the war who were all, as far as I know, Bradford Pals. I think its entirely fitting that we adopt the badge as suggested, and I also welcome the idea to produce a kit which pays tribute to Jimmy Spiers and Robert Torrance in a couple of years. I really want to support this idea, as it sounds brilliant, but I’d really have to see some concept ideas before fully commiting to the cause.There have been to many instances where well intentioned ideas go astray because of balance, and I feel that the most important points in this instance would be historic pertinence and aesthetic reality; it’d be no good slapping a badge on the shirt, if the shirt itself didn’t match the bill. I also agree ,great idea and also the extension of the idea to have the Pals badge on official merchandise ,not just shirts ,would be good as not everyone wants/can afford the new shirt every time. Beautiful article – agree 100% with putting the badge on the shirts. Thanks for this piece David, we will never, ever forget.